So, you have finally managed to arrange your first date. Congratulations! Now all you need to do is to make sure that your date is a success. Don’t worry, if you don’t know where to start. We’ve got you covered. Just follow our first date tips below and we are more than sure that everything will go smoothly. Look Your Best. We suggest that you put an extra effort to the way you look. Take the time to be well groomed, clean, neat and smell good. Make sure that your clothes are appropriate to the place you are going to. You know that first impression is crucial, so do your best to “wow” your date. You will also be more confident, knowing that you look your best. Be On Time. All preparations can take you longer than you expect, so make sure you have enough time. Also, don’t have any other plans or meetings before the date to avoid any distractions and possibilities of being late. It is always better to arrive to a date earlier, than to make the other person wait. Compliments! Be sure to make your date feel good by complementing the way she/he looks. This will set a good tone to your evening. Also, make sure you turn your phone off! Nothing should distract you. Smile. Nothing can make you more attractive to another person than a genuine smile. Let the other person see how happy you are to be here right now. Be Funny. Make sure that the other person is having fun time with you. If you know a few good jokes or funny stories – tell them. Be Attentive. 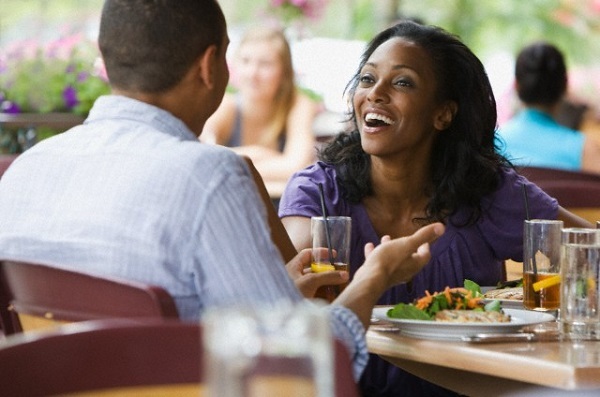 Listen to what your date has to say, do not interrupt. Let the other person finish, before you state your opinion. Make eye contact and say her/his name. This will make your date feel at ease and special. Relax and Be Yourself. Do not worry if your date is not having a good time. Just manage yourself well and try to enjoy the evening. Keep the conversations open and ask questions. Don’t pretend to be someone you are not. This will never work in the long run. You want to meet a person who is drawn to you for who you really are. Don’t Talk About Your Ex. You are looking for a new relationship, so don’t bring up your past. You are on a date to have good time, not talk about previous disasters. If you still have unresolved issues and feelings that you want to discuss, book a session with a professional therapist. Here is a person in front of you who is interested to know you better. Give yourself a chance to start afresh. Enjoy. Dating should be exciting and relaxing experience. Don’t stress yourself out trying to make it the perfect date ever. Chances are it won’t be perfect, because it is just your first date. When you’ll know each other better, you can have a lot of great dates ahead. So just enjoy your time together for now. Please don’t forget to rate, review and share the best mobile dating application – DateMeNow – with your single friends. This entry was posted in Dating Tips and tagged DateMeNow, dating tips on March 1, 2013 by Julia Travchenko.